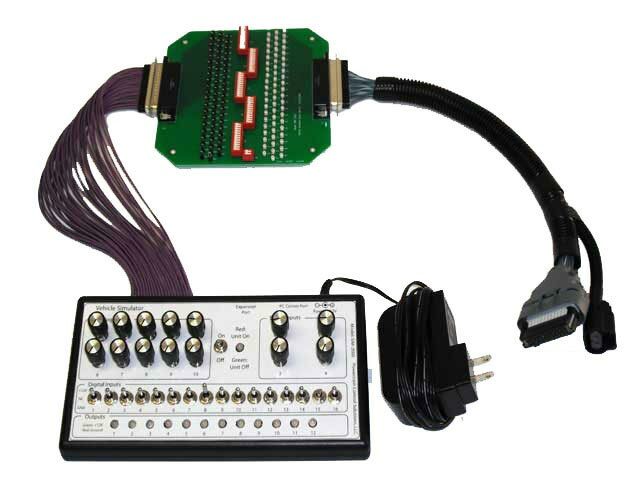 The PCS Vehicle Simulator gives developers or calibrators the ability to easily provide inputs to a device and monitor the outputs while the controller is on the bench. The simulator has 10 knob-adjustable analog channels (0-5V), 4 knob-adjustable frequency (speed) channels, 16 digital channels (active high, low, or open), and 12 LED's for monitoring outputs (indicates off, high, or low). The power input is +12VDC which can be provided from a power supply or the provided wall adapter. Computer communication uses a standard DB9 cable.